QMI has built and installed a multitude of automated ultrasonic and eddy current scanners, ranging from small bench-top and portable scanners to large industrial scanning systems. All systems are designed to use WINSPECT data acquisition software for C-scan imaging. 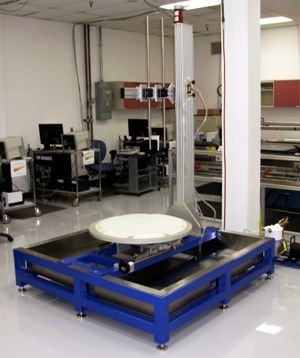 Systems for horizontal scanning of parts as large as 12ft by 40ft, at speeds up to 36 in./sec. A vertical tower scanner to scan vertical parts up to 8ft by 20 ft, at a maximum speed of 20 in./sec. Portable systems for scanning of large cylindrical, conical, and curved parts. A critical element of C-Scan inspection is to maintain a fixed relationship between transducer(s) and the test piece. In most applications, this is achieved by means of a scanning gantry, onto which the test piece is placed. The gantry holds the transducer(s) in a stable assembly that moves along X & Y axes in a raster-scan motion. The scanning motion is computer controlled by software that moves the scanner in discrete intervals. At each interval the software collects the voltage output from the Ultrasonic instrument (voltage is proportional to the ultrasonic signal amplitude) and assigns a pre-determined color value to that voltage. That color is then displayed on the computer monitor. The voltage/position measurements are stored as raw data in a file for future recall and printing. The result is a C-Scan image reflecting the internal structure of the of the test piece.